Car service, hotels, and accommodations for the president and other administration officials to attend climate change talks in Paris are costing taxpayers nearly $2 million, according to government contracts. 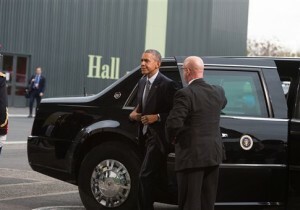 The COP21 meeting of global leaders, which President Obama said is a "powerful rebuke" to terrorists, began on Monday. Representatives from 195 countries traveled to Paris, burning 300,000 tons of carbon dioxide for the United Nations conference that is seeking to reduce global emissions. The tab for Obama’s motorcade alone totals $784,825. The State Department issued a $407,868 contract to Biribin Limousines, an international chauffeur service, for vehicles for the president’s security detail. "No Sustainability Included," the document states under a section for contract clauses. Numerous other contracts for passenger vehicle rentals, including $9,042 for accompanying press, totaled $376,957. Taxpayers were also billed $100,216 to book hotel accommodations for the president’s stay. Hotel rooms and cell phones for the U.S. Secret Service traveling with the president cost $16,642 and $4,034, respectively. A number of cabinet secretaries are also in Paris for the United Nations conference, including IRS Commissioner John Koskinen, whose car service tab is $5,400. Secretary of State John Kerry’s car service totaled $76,435, with three separate contracts worth $38,684, $15,789, and $21,962. Car service for Energy Secretary Ernest Moniz is costing $19,080, and two contracts worth $10,153 and $10,737 were issued for Agriculture Secretary Tom Vilsack’s chauffeur service. Interior Secretary Sally Jewell is also attending the conference, with hotel accommodations at the Tuileries Finances in Paris costing $36,091, and her car service totaling $13,903. In all, costs associated with the climate change summit totaled $1,805,282. The spending included $51,337 to rent a hangar for Marine One for the duration of the trip, $4,744 to rent office equipment, $12,478 for a hotel suite for a control room, and $7,239 hotels for the United States Agency for International Development. The government also paid Decoral, an interior design agency running accommodations for COP21, $486,989 and $134,778. Spending on the conference dates back to August, when the government paid $9,576 to rent a meeting room. President Obama’s goals he proposed for the conference are estimated to cost up to $45 billion per year and would reduce global temperatures by less than two-tenths of one degree.